I hope the new week finds you well, and that all of you have pulled down the ones and zeros for this month’s Iron Leg Radio Show. I was lucky enough late last week to sneak in a little bit of unscheduled digging in one of my old, once great, vinyl repositories. I say “once great”, because way back in the day, when I was but a sprite one would walk through the doors of this place and reel at the massive amount of records to paw through. So large and wonderful a place that should you become bored looking through the rock and soul you could stoop down to floor level and start looking through the comedy, spoken word and international sections, all filled with interesting stuff. Sadly, those days are gone, and with the influx of vinyl cut short, the outflux into the collections of my friends and I has also shrunken and the pickings, in the word of a great philosopher can only be described as slim. That said, it’s still worth taking a ride out there every once in a while, if only to flex the digging muscles and get a taste (however slight) of the old ways. Though most of the solid stuff is no more (the funk and soul section is probably 60% brand new reissues), there are still interesting things to be had if you put in enough effort. So, dig I did, and I managed to pull out a handful of very cool things for the Iron Leg ‘to be blogged” folder, including today’s selection’. I’d never heard of Peter Law and the Pacific before I laid hands on their album, but I could not very well leave a menagerie of mod haircuts and clothing sitting in the ‘New Arrivals’ bin, never having sampled its delights. Said delights were not exactly abundant, but as is often the case, there, buried in a haystack of ordinariness and attempts at mass appeal, was a gem waiting to be discovered. That gem was a tune called ‘Remains to Be Seen’. 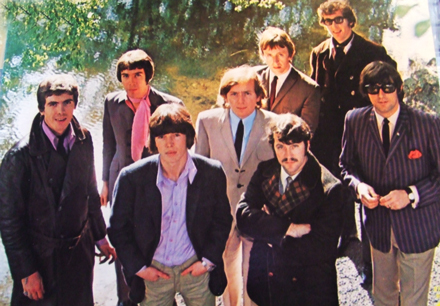 Peter Law and the Pacific were a showband out of Northern Ireland that plied their wares through the 60s. Showbands were (and still are) a kind of all-purpose entertainment machine, performing a wide variety of pop sounds in clubs, bars and theaters for an equally diverse audience. Most of the showbands included small horn sections, truncated from the days when the same kinds of entertainment were provided by full orchestras. Peter Law and the Pacific played pop, rock and country, the latter bringing them a Canadian hit in 1968 with their cover the Mel Tillis song ‘Ruby’. 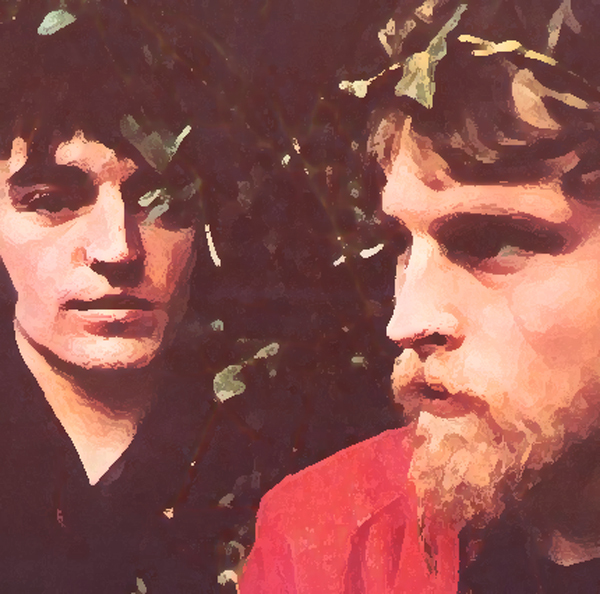 I did mention that they also recorded pop and rock, which is how they came to cover a fairly obscure but very groovy bit of Australian popsike (originally recorded in 1968) called ‘Remains to Be Seen’ which was originally recorded by the duo of Steve and Stevie. 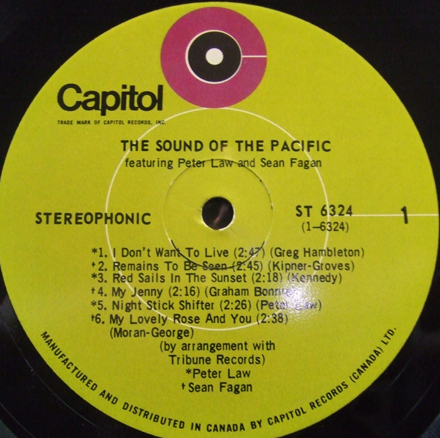 Law and the Pacific recorded their version in 1969 and released in it Canada on the Capitol label. What you get is a very nice approximation of Deram/Decca popsike with vocals by the band’s second singer Sean Fagan. The original recording of ‘Remains to be Seen’ was released in the UK on the Toast label, which is where Law and the Pacific probably heard it. It’s a very groovy, very obscure number, and I hope you dig it. Welcome to the fifth edition of the Iron Leg Radio Show. I have some very groovy stuff lined up for you this month, including the usual psychedelic odds and sods, a nice set of sunshine pop and a set devoted to the sounds of one of my very favorite groups, the Peddlers. As always, I hope you dig the show, and I’ll be back next week with something else ear delicious. It is the dawn of a new week – if not a new era (apologies to the Specials) and I for one am ready to meet the onrush of new things, even if it’s just being overrun by knuckle-dragging, neo-puritan Morlocks. This month’s Iron Leg Radio Show will be hitting the page (episode #5) next Monday, so hang on tight on account of it’s a good one, if’n I say so myself. The tune I bring you today is one of those deals where the story behind the music is almost as cool as the music itself (though in this case it’s a very close race indeed). I’d heard of the Wild Ones long before I found a copy of their album last year, but had no idea how deeply they were woven into the fabric of that beast we know as the 60s. What if I told you that they were the house band at one of the great in-crowd discotheques of the era (home to the pioneering platter splatterer Terry Noel) , led by a male starlet (Jordan Christopher), who happened to be married to the club’s proprietess (Sybil Burton), who herself was the ex-wife of a huge movie star (Richard Burton)? 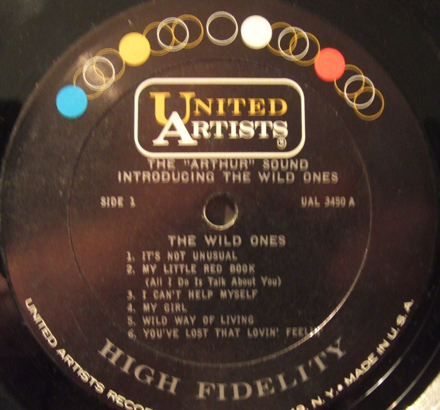 The club in question was named Arthur, and the album in question, ‘The Arthur Sound’ by the Wild Ones is an interesting relic of that transitional era when the jet age twist boom, which lit the fuse of the discotheque explosion, was right on the verge of turning into something a little Mod-der. The Wild Ones were the house band at Arthur, and despite the fact that they ( at least as evidenced on this record) weren’t the hottest band in the land, had a certain rough, post-frat, pre-garage edge to their sound, not unlike the au-go-go sound of early-era Sunset Strip. 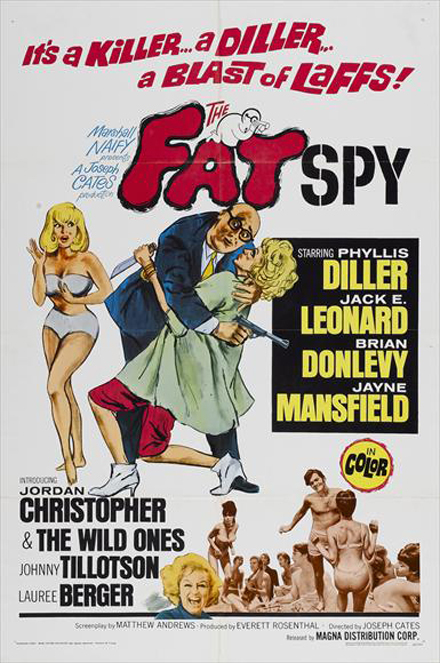 The tunes I bring you today, interestingly enough both appeared (as did the band) in another fantastic era-specific artifact, a film called ‘The Fat Spy’ that starred Jack E. Leonard, Jayne Mansfield and Phyllis Diller. I mean, honest to god, if the pop-culft factor gets turned up one more notch my head may explode. ‘Wild Way Of Living’ is the garage-ier of the two, due in large part to some very groovy combo organ by keyboardist Tom Graves. It’s not hard to imagine a packed room full of celebrity (and celebrity wannabe) swingers frug-ing to a tune like this. The album is ostensibly “live” but I’d be very surprised if this was anything more than “live in studio”. The second cut, a dark, almost weird version of Titus Turner’s ‘People Sure Act Funny’ wouldn’t be out of place on a comp of teen basement pounders. This probably has something to do with the fact that the Wild Ones weren’t some kind of pre-fab combo cranked out to augment the club. They were an existing band whose singer was an aspiring thespian who just happened to have hooked up with a discotheque mad celebutante (though she was creeping up on 40 at the time). In fact, Jordan Christopher left the group not long after this album came out to concentrate on his acting career. The band remained together, eventually recording the original, pre-Troggs version of ‘Wild Thing’. Jordan Christopher went on to star in one of the truly twisted psychotronic films of all time ‘Angel Angel Down We Go’ (aka Cult of the Damned). I hope you dig the sounds, and I’ll be back next week with the Iron Leg Radio Show. Welcome back to the ongoing series of poptacular musical excursions otherwise known as Iron Leg. While trolling through the archive of previously digimatized, yet not quite blogged music, I happened upon one of my favorite slices of UK freak folk. The Incredible String Band was one of those groups that I knew of (pretty much just the name) for many years before I actually heard them, an event that occurred when I picked up an expensive (but wholly excellent), imported, multi-cd comp of psychedelic music during the early days of compact discs. The track in question was their 1968 single ‘Painting Box’, by which I was seriously underwhelmed. Here, finally was the Incredible String Band, and I was perceiving strings, but a decided lack of incredibleness. 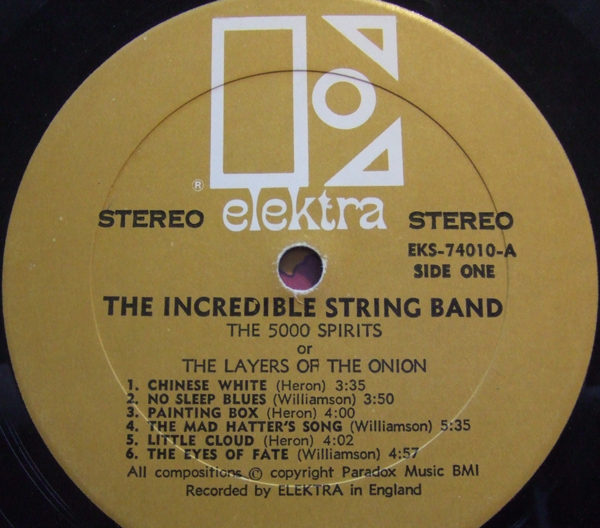 That said, years later, during the depths of my UK folk/folk rock mania, with Nick Drake, and Fairport Convention and Bert Jansch etcetera etcetera, I found a Rykodisc reissue of the album that included that track, ‘The 5000 Spirits or the Layers of the Onion and decided to explore further. Released in July of 1967, it was their second album, and their first since the departure of Clive Palmer. Truth be told, by the time this album came out, the group with the grandiose name was basically the duo of Mike Heron and Robin Williamson, augmented by Williamson’s girlfriend Licorice (yes, Licorice) and bassist Danny Thompson. When I first had the CD, I dug it heavily because despite the surface folksiness, the music was in fact the work of a couple of twisted hippies and the sounds they made owed as much to then contemporary England as it did to Morris Dancers and the like. What I also noticed was that the music on the album had a slightly schizophrenic bent, with two distinct musical personalities fighting for prominence within. A look at the writing credits revealed that the stuff I was really digging was credited to Robin Williamson, and those I dug not so much to Mike Heron. The tune I bring you today is my favorite Williamson-penned track, ‘No Sleep Blues’. While there are certainly elements present of what might be termed ‘old time folk’, i.e. traditionalist hootenanny plucking, it was overpowered by a certain longhairs on caravan in Morocco vibe, otherwise known as a hashish haze,or at the very least the residual effects thereof. I can well imagine the English equivalent of Pete Seeger tearing his (or her) hair our at the roots when hearing stuff like this, but I also see the more cosmopolitan contingent of the freak scene shying away from it as well (until they all morphed into hippies a few years on). Heron and Williamson went on to a long career as the ISB, and individually as well.